Concentrated vehicle wash formula engineered to provide a great clean while dramatically reducing time drying and buffing the vehicle. Simply wash vehicle and rinse with a hose. The water will sheet off rather than bead thereby eliminating dry dust spots. Ideal for both auto and manual car wash. When you need a good clean in a hurry such as rental car agencies, fleet management, transit authorities, county and municipal vehicles and dealerships, then Wash & Sheet is a must! 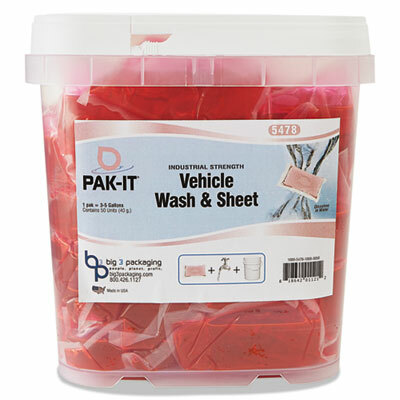 1 PAK-IT� per 5 gallons. Application: Cars; Trucks; Buses; Limos; Boats; Applicable Material: Metal; Fiberglass; Glass; Plastic; Rubber; Dirt Types: Dust; Soil; Tar; Oil; Insect Residue; Bird Feces; Physical Form: Liquid.